For all cabinets big and small, our range of Cabinet Locks can secure your important files and documents. Whether it be your cupboard, filing cabinet or even for glass doors, we provide you with a security solution! With so many different variations of lock, we can offer a solution to a majority of problems! This includes Cam Locks, Push Locks, Cylinder Locks and more! Check out the full range of Cabinet Locks here! For securing your cabinet, check out our Cupboard Rim Lock range. 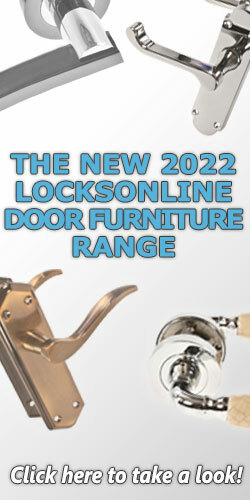 We have a range of different lock..
For a simple locking solution, check out our Push Locks and Push Button Locks. With these locks, yo..
For replacing your glass door lock, check out our replacement Glass Door Cylinder Locks. Not only c.. Similar to the Cam Lock, the Inlaid Cylinder Flap Locks provide a simple solution for locking your o..
Our range of Cam Espagnolette consists of spindles, striking plates and profile rods. Whether it be..
Our Extending Rod Locks are mainly suited for Inset Doors. When fully assembled, the rod will shoot.. Suitable for cabinets, drawers and other office furniture, this is our range of Piccola-Nova Lock Ca.. If you are looking for a darker, more olden look, our Antique Finish range will fit the bill. Rangi..
From decorative keys to striking plates, this is our range of Cabinet Lock Accessories. Anything in..
• With Ø 22 mm cylinder• Backset: 37 mm• Screw fixing• For drawer use but can be adapted for left or..